The latest title in the best-selling 100 Words series offers a fascinating look at the vocabulary of science and technology. Thoughtfully chosen by the editors of the American Heritage® Dictionaries, these words will stimulate inquisitive minds to explore new terrain, and challenge long-standing science buffs to measure up. Covering a wide variety of scientific fieldsfrom evolution and ecology to physics and computer sciencethe words are representative of the vocabulary required to understand the most important concepts of science today.Each term is defined and explained in clear, nonscientific language, with examples showing the reader the importance of the word both in its field and in daily life. Many entries have extra features explaining word origins or providing fun facts and enlightening details. Key illustrations make the abstract comprehensible. 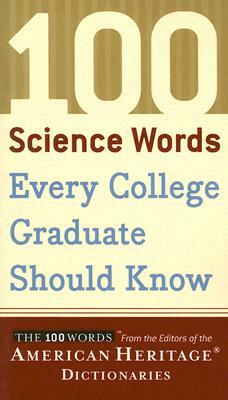 Subjects discussed include absolute zero, dendrochronology, game theory, histone, Kuiper belt, Munchausen syndrome, piezoelectric effect, rain shadow, time dilation, and xerophyte.A great stocking-stuffer, graduation gift, or reward for the expert in the house, 100 Science Words Every College Graduate Should Know is sure to delight, surprise, and inspire everyone interested in the language of science and technology.Paperback. Illustrated. xi, 116pp. Previous owner's personal library mark inside front cover. Full refund if not satisfied.